Large hail and damaging winds possible ahead of this strong line of thunderstorms. 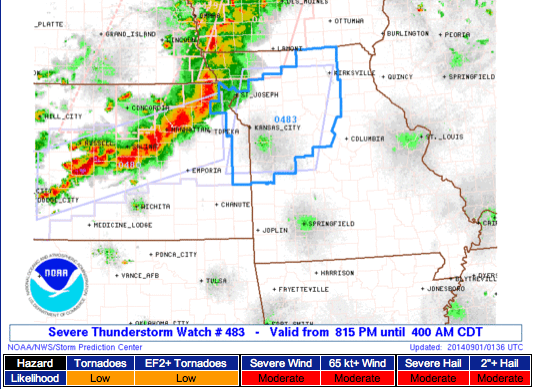 Here is a view of the entire squall line as of 8:30pm. This is the end of the severe weather coverage on the blog this evening. 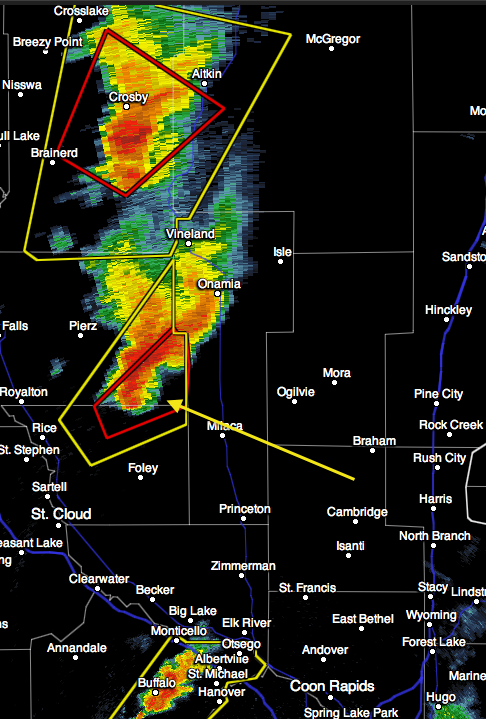 Strong tornado indication. 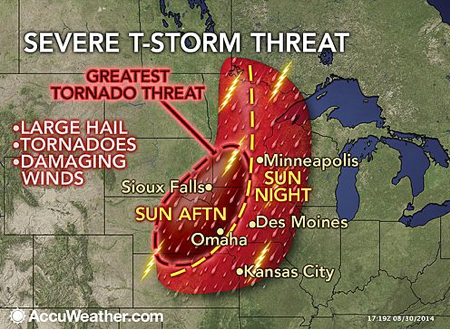 People in Sidney and surrounding area (red polygon) should take immediate safety precautions!! 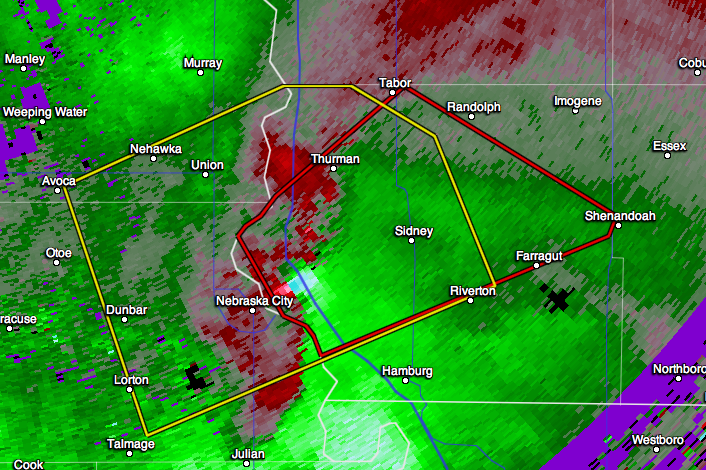 The tornado is red/blue combination ENE of Nebraska City. 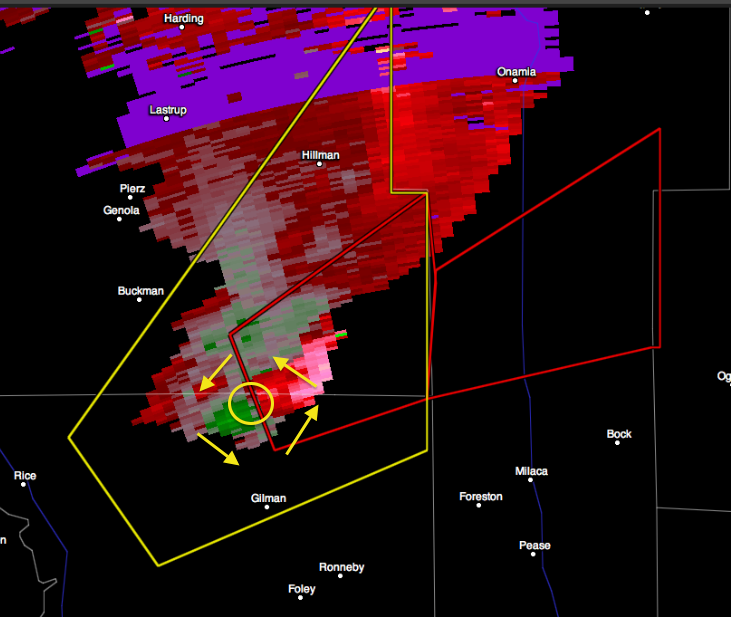 The tornado is moving ENE. As of tomorrow, I will erase routine severe weather coverage a few days after the storm. Of course, the coverage of historic storms (i.e., Hurricane Sandy) will remain on the blog for anyone who wishes to go back and see how the storm was coverage in real time. This is a request made by several readers. So, take a look at this evening's storm coverage. But, it will be deleted in a day or two. 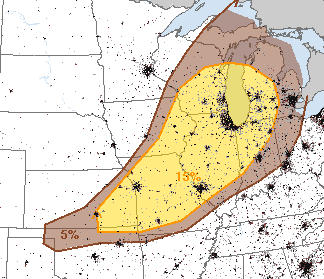 Very large hail and damaging winds are both possible. 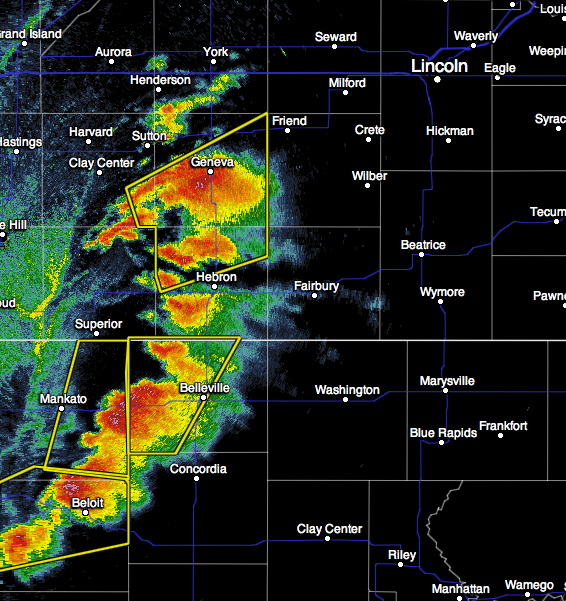 There are thunderstorms in northeast Nebraska that may cause giant hail (≥2.5 inches). They are moving northeast. Radar 4:33pm. 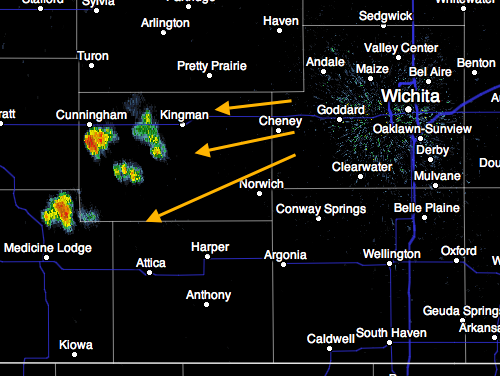 Radar 4:36pm shows thunderstorms near KS-NE border that are starting to show signs of rotation. 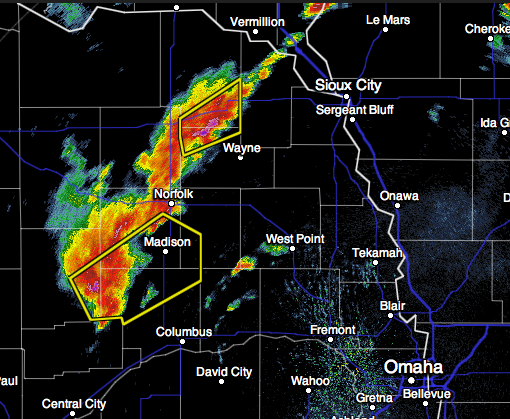 From this line toward Lincoln, NE and Marysville, KS should keep a close eye on these storms. I believe they have the higher chances of producing a tornado/damaging winds. Storms should move toward the east northeast. Near term, the area from U.S. 81 from around Concordia and Hastings to Omaha and Lincoln are at risk. Please keep up on the latest information if you live in or near this area! 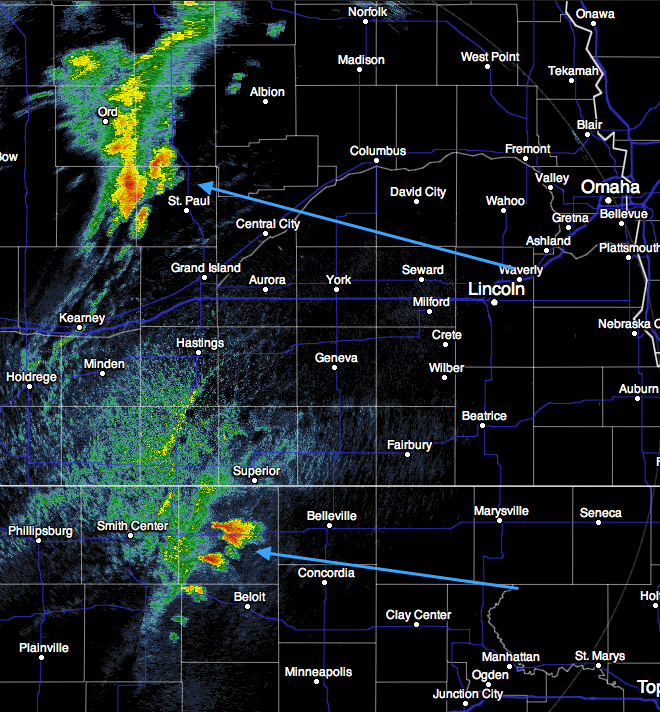 Areas of rapidly developing thunderstorms (arrows) in southern Nebraska and northern Kansas. 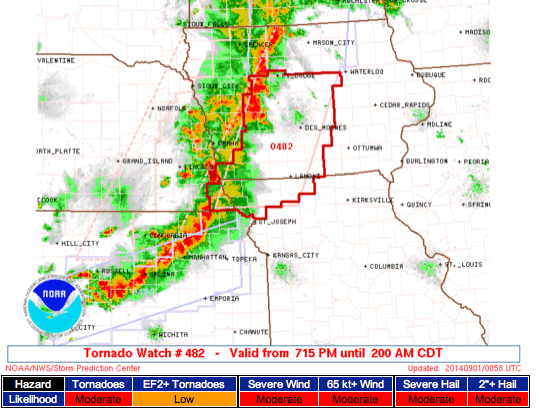 Radar from 3:26pm CDT. There is the rather high (for this time of year) potential for severe thunderstorms in this region as the afternoon progresses. This forecast is valid from 3pm this afternoon to 7am Monday. The forecast below (15% is the significant threshold) for 7am Monday to 7am Tuesday. Remember this posting from nine days ago? A number of sources, including the DrudgeReport, were forecasting a major hurricane to hit New Orleans on the ninth anniversary of Katrina. Today is the anniversary. Oops. 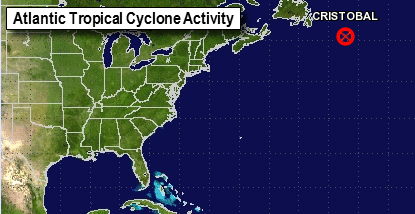 The storm that was supposed to strike New Orleans became Hurricane Cristobal. Its current position is below. The error is more than 2,500 miles! 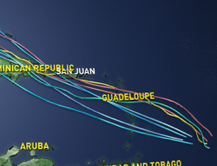 Hurricane forecasting is not easy. 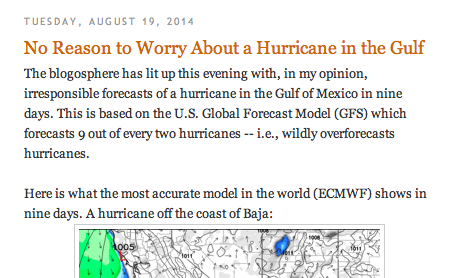 Combine that with people trying to drive page views with "panic forecasts" and you get an ugly combination. So, please choose a responsible source for your hurricane forecasts and refuse to spread the panic forecasts -- as that is what they want. In summary, these articles provide a stark picture of the dangers to science of groupthink and intimidation of science with non-consensus views. In my opinion, climate science is suffering badly from these. 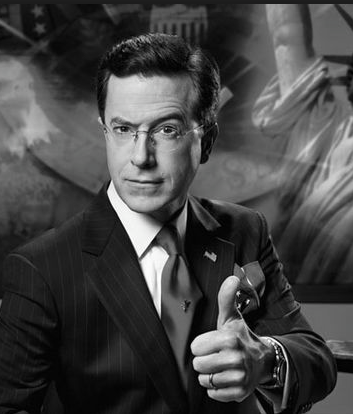 When scientists stop arguing facts and start imitating Stephen Colbert, you know they are on the losing side. 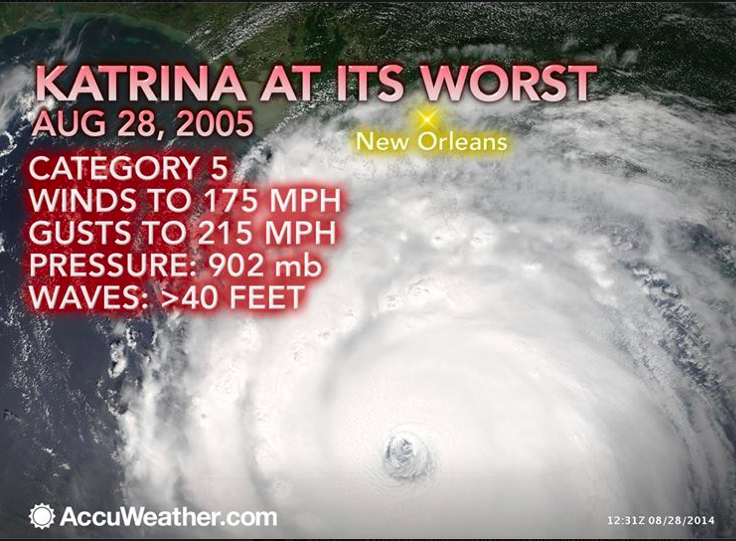 Nine years ago, Katrina was headed for New Orleans. It weakened considerably before it reached land. Even with the weakening, nearly 2,000 people died in the storm. Want to know what really went wrong in Katrina and why so many lives were lost? 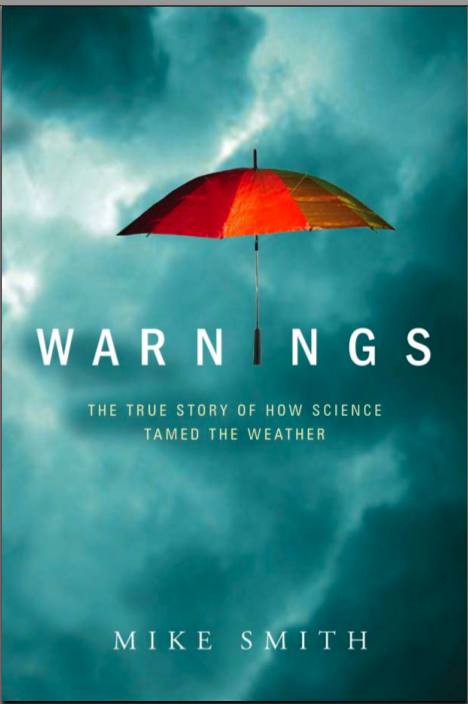 Check out the "Murder By Bureaucracy" chapter of Warnings. Addition: Comment from a reader. Five Stars -- "Make me giggle, make me mad and make me cry. "Warnings" did all that . . . and more." Amazon. Over the past two years, the National Weather Service — the agency tasked with issuing life-saving severe weather watches and warnings across the country — has had a bevy of technical glitches that have severely impeded its operations. These incidents, which have ranged from the apparent issuance of a massive (and false) flood watch for all points east of Lake Michigan and north of Florida, to letting a tornado go essentially unwarned due to failures of automated systems, have the attention of the agency's leadership, the NWS says. Andrew Freedman has the full story, with a comment from yours truly, here. 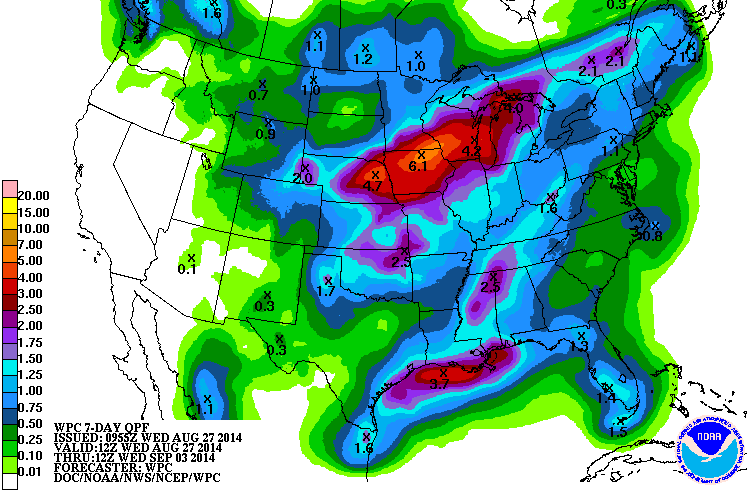 Generous rains are forecast the next seven days in the Upper Midnest. The monsoon takes a break in the Southwest and needed rains fall in the Great Plains. One caution: The area from Lincoln to Omaha to Des Moines/Ames, which has experienced some rain the last few days, have a flood risk if this forecast is exactly correct. I am on this week's Big Picture Science. The entire episode is here, my segment is here. How Does a Major Earthquake Affect Sleep? The heavy rains, which have caused considerable flooding, have ended in Montana. 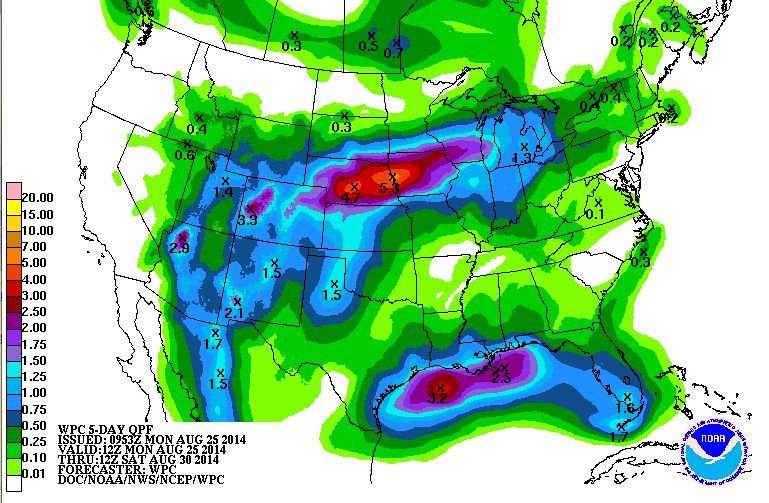 Over the next five days, heavy rains fare forecast for Nebraska and Iowa. There are whole university "centers" for studying how to convince the public and scientists like me that global warming is an immediate, catastrophic threat. So, I thought it would be fun to turn the tables and link to a psychological study that helps explain why, for example, the global warming cult gets more 'confident' as the science gets less definite. The entire story is here. Why call them rituals? Because it is not all that clear that they actually do anything much for the natural environment. For example, the costs of curbside recycling often outweigh purported benefits, and lower organic crop yields mean more land taken from nature. There is zero color correction or special effects in this photograph taken just a few minutes ago from the Smith House in northeast Wichita. There is an area of small thunderstorms to the southwest of Wichita (arrows) and these are towering cumulus clouds along the cold front north of the storms. 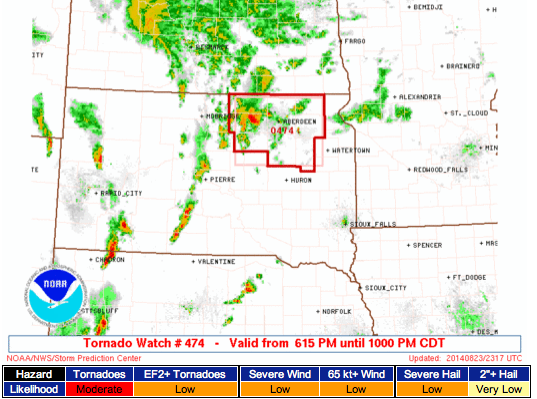 Both radar and tornado image (courtesy of SevereStudios ) are from 6pm CDT. The Doppler winds at 5:55pm when the tornado was forming. The tornado location is the circle and the arrows indicate the direction of the "mesocyclone" -- the winds surrounding the tornado. 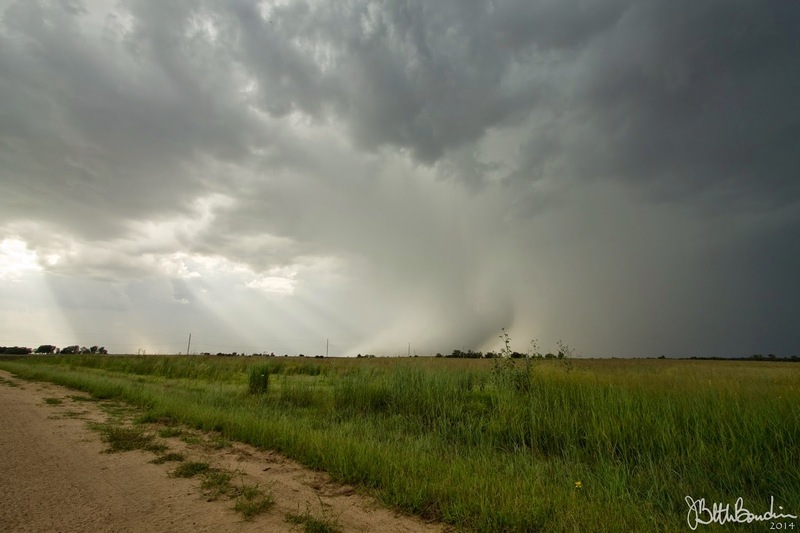 How Fast Can Tornadoes Move? 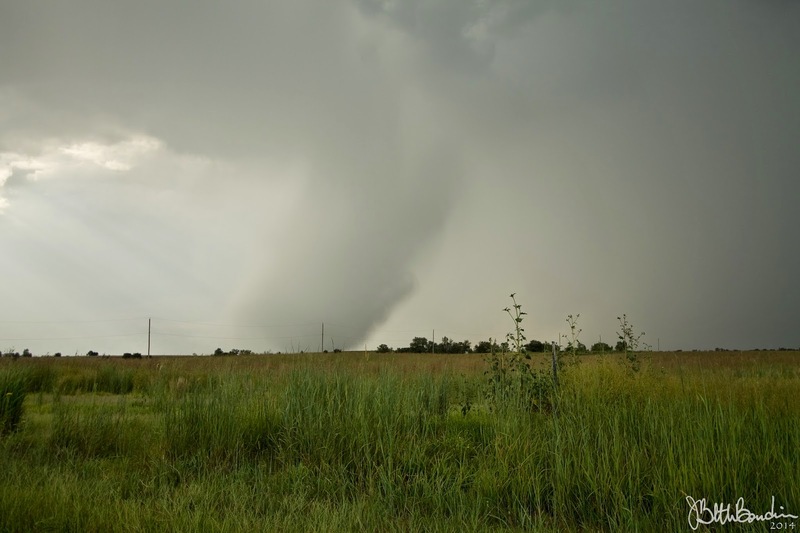 There was a recent online discussion about the maximum forward speed of tornadoes. We've known for many years that 70-75 mph has been achieved on a number of occasions. The above Empire, Alabama, tornado was moving faster than that. This is why it is important, especially in February through April tornado situations, to keep up on warnings during tornado watches. Storms can move into your area very quickly. Also, I often get asked if tornadoes can go up and down mountains. The video clearly shows it moving down a mountain. This is in effect until 11pm Central time. 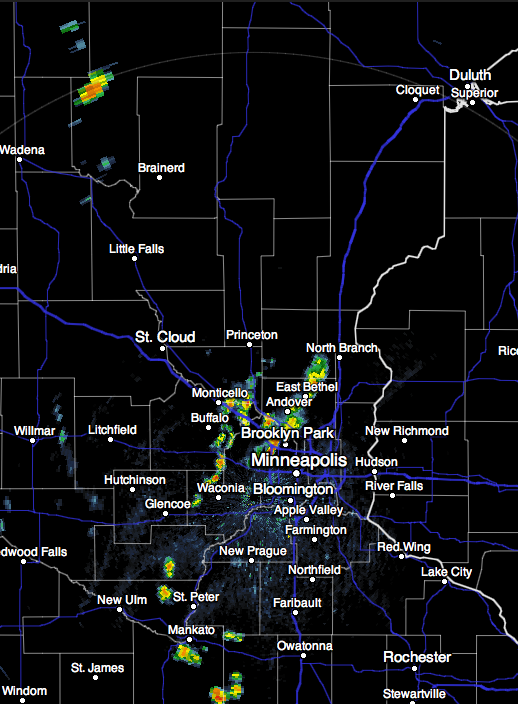 Thunderstorms, as of this 3:49pm radar scan, are developing across the area. Remember high school physics and the "inclined plane"? For today's generation of high schoolers beginning the fall semester, Forecaster Evie provides this demonstration of the utility of the inclined plane. Evie wanted pizza put into her bowl. To make it easier to get the pizza, you see her assess the situation. She decides the best way to get her bowl to the pizza is to use an inclined plane. Her first attempt is unsuccessful because she is grasping both the box and the bowl. She chuckles at her mistake. She deliberately repositions the bowl and creates the inclined plane. The bowl reaches the pizza for loading. She chuckles at the success of her plan. Of course, in physics class they talk about loading trucks, railcars, etc. Evie prefers the simpler approach and uses a bowl for this demonstration. 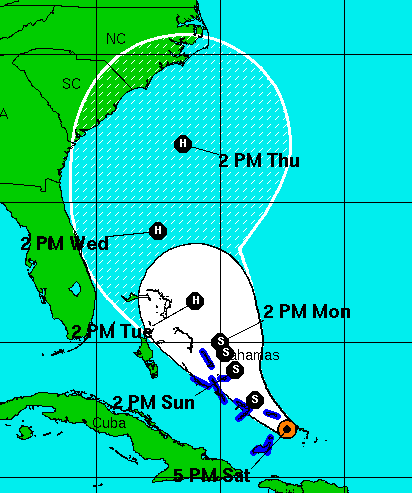 The National Hurricane Center is monitoring a tropical depression headed for the Bahamas. It is forecasting the depression to reach hurricane strength (where you see the "H") symbols. People in the Southeast coastal areas should keep an eye on the storm it will take probably another twelve hours (i.e., Sunday morning) before we can get more confident on the path/intensity. Note: This is the storm the meteorological rabble-rousers were forecasting to hit New Orleans at one point last week. This watch is in effect until 10pm. Please keep an eye out for any approaching thunderstorms. If they approach, please monitor weather radio or local media. 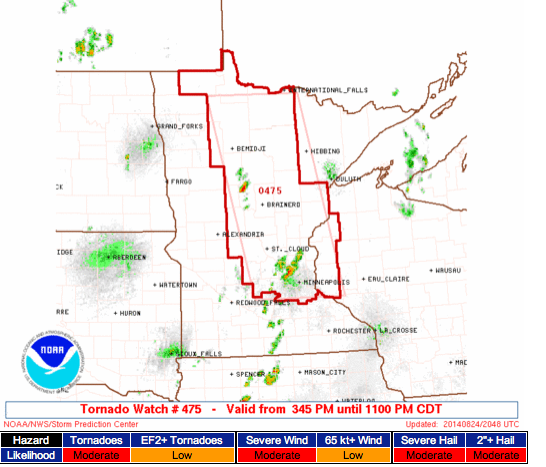 Note: I'm very pleased the NWS Storm Prediction Center issued this small, short-duration watch. 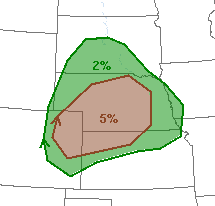 I believe this is a direction they need to move as we get better at identifying geographically small tornado threats. Five percent is the significant threshold. People in the five and ten percent areas should keep a close eye on the weather if thunderstorms approach. There is also an increasing flooding risk over the week and first of next week. 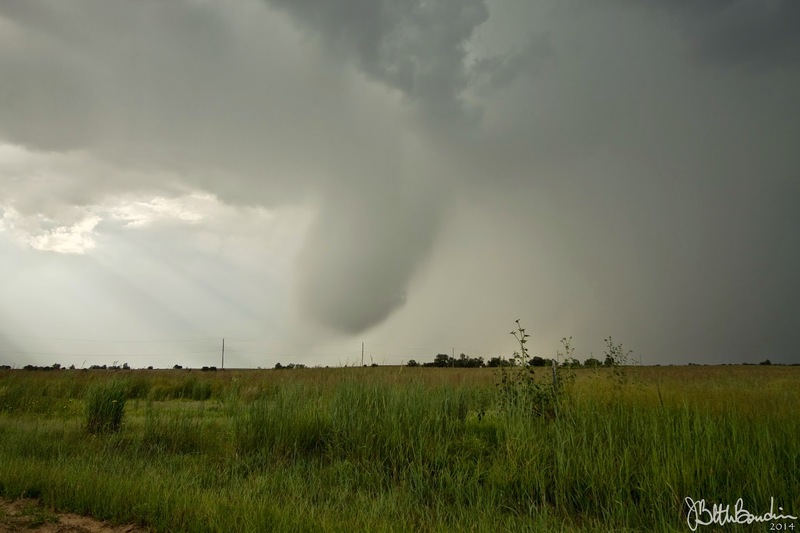 Storm chaser Beth Bowdoin nailed a microburst in Reno County, Kansas, yesterday afternoon. She kindly agreed to allow me to use them. The first shows the downburst descending from the cloud. The second photo shows the globule of torrential rain almost to the ground. Because the storm is moving from left to right, the rain takes a tilted appearance. During this time cloud-to-ground lightning (not shown in the photos) picked up in frequency. This is common with downbursts. The third photo shows the microburst made it to the ground and the winds began to spread. 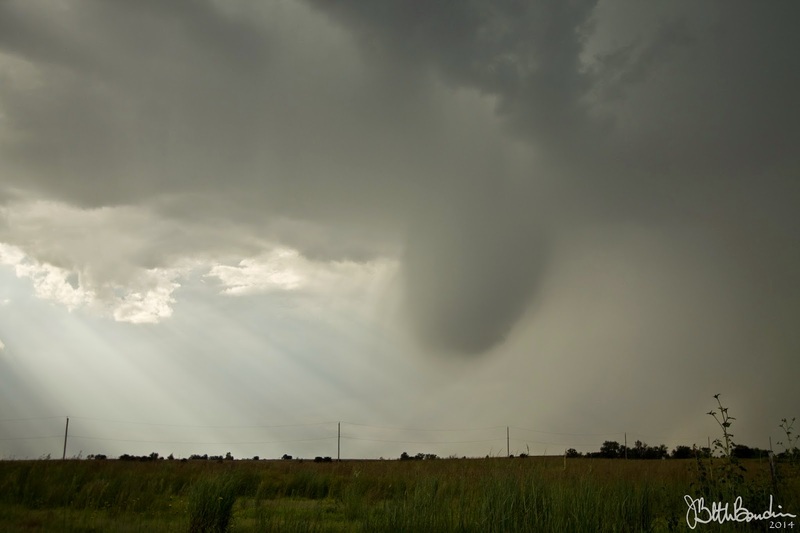 Photo number four has the downburst spreading and a reinforcing globule descending. I've increased the contrast to show the wind flow in the above image. The circle shows the horizontal rotation as it falls to earth. 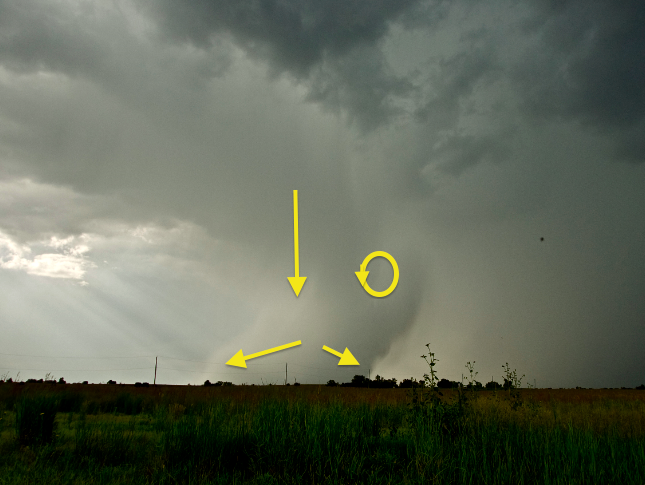 The final image shows the reinforcing globule almost to the ground with the original microburst continuing to spread. Here is a diagram of the winds with the final image. 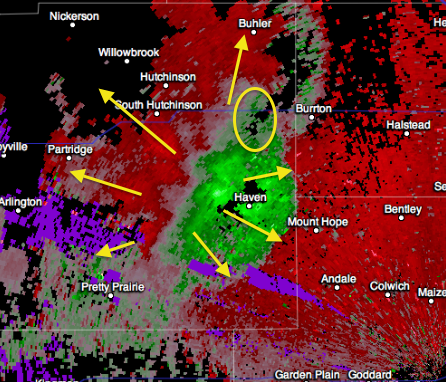 Eleven minutes later, the Doppler velocity data shows the wind flow after the microburst has spread out. 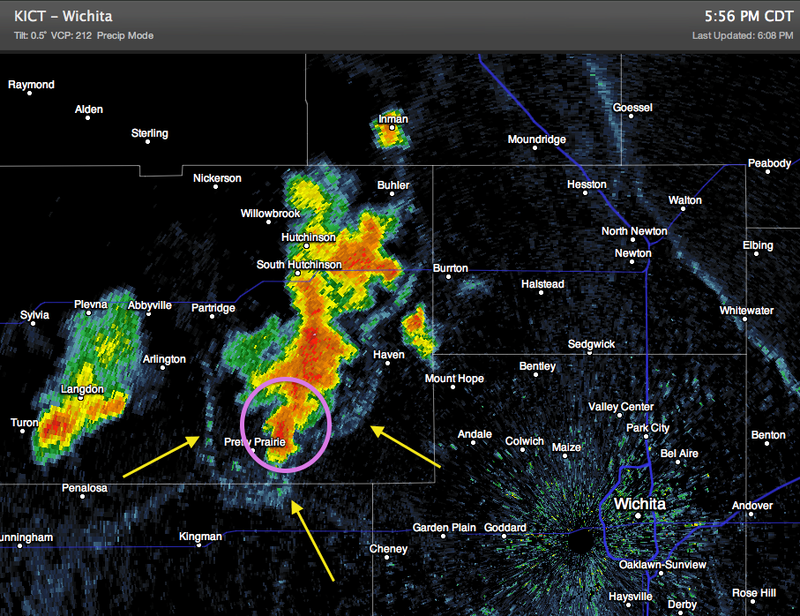 I've circled the northern (second) extension of the microburst. The greens are winds blowing toward the radar and reds away from the radar which is located at Wichita's Mid-Continent Airport. The peak wind that I saw was near 50 mph. That might not be exact. 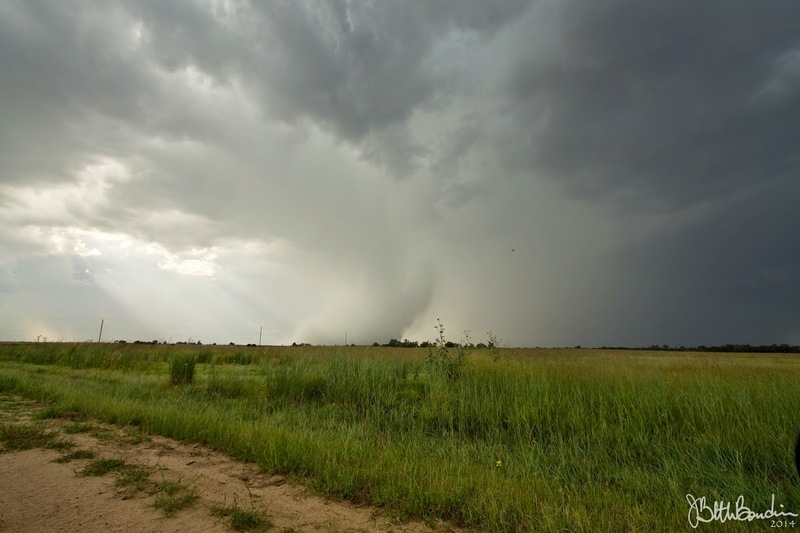 Downbursts are an extreme hazard to landing and departing aircraft. 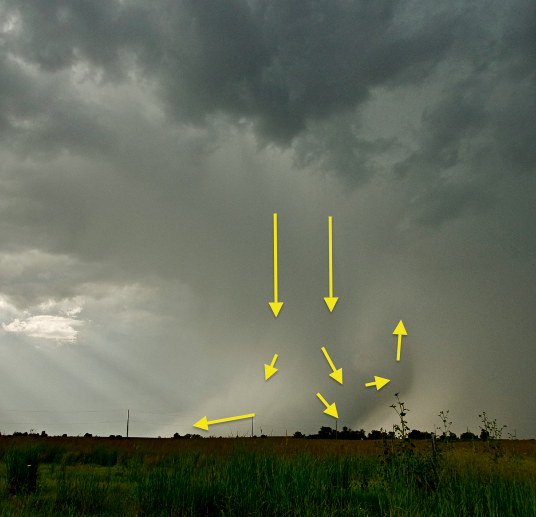 If you wish to learn more about them, please see Anatomy of a Microburst, the second all-time most popular posting on this blog. Thanks again, Beth. Great photos. 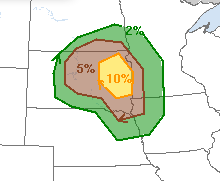 Keep an eye on the weather, especially in the 5% area. Here is something you may never see again: the intensity of thunderstorms along I-8 in Southern California. I fully expect the highway to be closed or even washed out. Intense thunderstorms with flooding problems are also possible along I-10. Finally, there is a large cluster of storms along I-15 that could cause flooding. Amber is a severe thunderstorm warning for wind gusts of 60 mph and large hail. 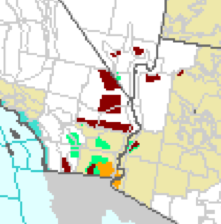 Maroon is flash flood warnings. Greens are flood advisories. What Difference Does Better Construction Make? And, why mobile homes have so many problems in high winds. Details here. This graphic is from a television station's forecast alleging they can forecast the location of a hurricane more than a week from now. I'm not showing the entire graphic because I do not wish to give any publicity to this -- and much more -- nonsense on Facebook and Twitter the last 24 hours. Perhaps because it has been a record-calm hurricane season* in the Atlantic so far perhaps inducing boredom, the number of nonsense hurricane forecasts the last two days is off the charts. While a hurricane might occur somewhere in the Atlantic next week (no way to know at this point) the ECMWF, the single most accurate meteorological model, shows no hurricane anywhere in the Atlantic, Gulf or Caribbean the next ten days. My advice: Don't sweat it. And, consider unfollowing or unfriending these people on Twitter and Facebook. * Ever notice how the global warming cult never talks about the record scarcity of major hurricanes affecting the United States? Losing Electricity in Frigid Weather? "The Public Isn't Buying the Climate Line"
Sunday Fun: Hurricane "Stadium Effect"
First-Ever Death From a Dust Devil?